People often ask me where I find the time to do what I do, and honestly, it is not that I have a magic wand. 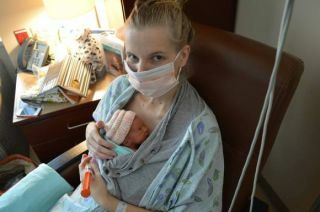 I multi-task a lot, sometimes I am over-connected and need to find a better balance, sometimes it is late at night when I can’t sleep, and at one time it was sitting next to a little, tiny baby growing in the NICU. My second book, published by Corwin, is coming out in September, and it was written in that little room, in the NICU at Meriter Hospital in Madison, Wisconsin. I filled it with the hopes for Augustine and the type of school I wish for her when she gets to be 5. I filled it with the dreams I have for the schools I work at, for the teachers I learn with, for the students I teach. And so my second book is filled with empowerment. A plea to transform our schools from top-down decision machines, to environments where there are many leaders, many ideas, and staff, as well as students, that feel that they are in control of their educational journey. Much like my first book, Passionate Learners – Giving Our Classrooms Back to Our Students, this book is meant to be an idea book, a book that gives you things you can do right now to change your environment. A book that will give you hope, hopefully strengthen your vision of what a learning environment can look like, and re-ignite your feeling of power in education. So this book, Empowered Schools, Empowered Students – Creating Connected and Invested Learners, will hopefully end up on your to-read list. It will hopefully change the way we do school, no longer relying on our old methods, but instead embracing all of the stakeholders, including the students, when we discuss what school should be like. I hope together we make that change, not just for ourselves, but for all the kids we work with. Just like Augustine at 6 months is realizing her own potential, we need to make sure that our schools support all students and all staff to leave their mark and change the world. To pre-order your copy, please go here.